There’s a good story to be told about a man who dedicates his life to revealing underhanded deception, but an even greater film when analysis of those methods used to expose frauds are themselves beguiling. Such is the cinematic story of James “The Amazing” Randi, who after achieving success as a Houdini-esque magician and escape artist, dedicates his life to smoking out false psychics, faith healers, and New Age mystics. An Honest Liar documents Randi’s most publicized attempts at revealing what he believes to be administers of trickery for the sake of deceiving audiences. Some of these charlatans are harmless, such as the Israeli psychic Uri Gellar, famous for bending metal objects with what he describes as only a transfer of mental energy. The results are no more than parlor tricks, but the difference between Gellar and Randi performing the same trick is Randi will always be upfront with his audience about his deception. And then there are the dangerous quacks like the charismatic loon Peter Popoff, famous for manhandling patrons seeking miracle cures for various illnesses at faith revivals. One doesn’t need to look far to find the threats posed by a man persuading thousands of people to throw away their pills all while invoking their God’s great power and strength. But instead of painting The Amazing Randi as a saint responsible for educating gullible sheep (to which Randi says we all are) we are forced to question his methods used to reveal the tricksters themselves, which often include multiple forms of deception. There is a truly delicious segment of his epic public sabotage of Uri Gellar on Johnny Carson’s Tonight Show. We are on Randi’s side, but it’s impossible to ignore the hypocrisy in his methods, regardless of the ends justifying the means. Is there ever really a moral deception? Filmmakers Justin Weinstein and Tyler Measom have a wonderful subject in Randi, who is as endearing as they come, and genuine in his love of magic to entertain and delight audiences. The only promise Randi makes is that you will be deceived, and it’s that honesty that drives the moral compass for the rest of his life, and what sets him apart from opportunistic frauds. Additional talking head interviews from Adam Savage, Penn Jillette, and even Uri Gellar, add to the insightful and witty tone of the film. The only misstep lies in the cursory exploration of Randi’s private life with his partner Jose Alvarez, especially when a deception in the relationship is revealed. The fallout is so quickly tacked on at the end of the film it might as well be an afterthought, or a convenient twist that allows the filmmakers a chance to see the master himself duped. It’s a plot device that ends up adding little suspense or intrigue, and really belongs in another film. 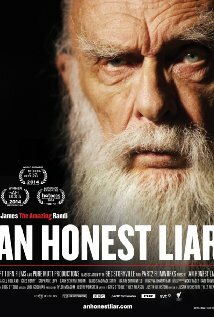 An Honest Liar is a worthy documentary of Randi’s life crusade to debunk those that would use his beloved magic to harm others, and a wonderful conversation starter about the complex aspects of deception and “believing is seeing” in our society. An Honest Liar opens today at the Ritz Bourse.